Our soils are in trouble. Over the past century, we’ve abused them with plowing, tilling and too much fertilizer. What many think of as “just dirt” is actually an incredibly complex mixture of rock-derived minerals, plant-derived organic matter, dissolved nutrients, gases and a rich food web of interacting organisms. By plowing and overtilling, we have increased erosion on agricultural fields by 10 to 100 times natural rates. Over just the last several decades, we may have lost about half of the topsoil that natural processes produced over thousands of years in the U.S. corn belt. Topsoil is rich in soil organic matter – dark spongy material formed from decomposed plant and animal tissue. Soil organic matter is critically important: It helps soils hold onto water and nutrients and supports soil microbes that recycle nutrients. Loss of soil organic matter has made many farms increasingly reliant on fertilizers, pesticides and herbicides. Much recent research has focused on adding organic material back to soils to restore them. This is an important strategy, but I believe we also should aim to enhance the microbes that are responsible for soil formation. I was part of a research team that demonstrated in a 2015 study that adding efficient microbes to soils can enhance the percentage of plant carbon that is transformed into soil. New research suggests that by fostering an efficient and active soil microbiome, we can accelerate soil regeneration far beyond typical rates seen in nature. Natural soils are thriving with life. They contain an incredible diversity of microscopic bacteria, fungi, viruses and other organisms. A single handful of soil can contain tens of thousands of different species. These microbes interact closely with each other, forming complex networks. They communicate with chemical signals. They work together to break down complex organic materials, including dead plants and animals. They often work in teams to complete biochemical processes, such as transforming nitrogen from an inert gas to plant-usable forms, and recycling it from dead plant materials back into dissolved forms. In healthy soils, organic matter is protected from decomposition inside clumps of soil called aggregates. But tilling crushes aggregates, unlocking their carbon and allowing microbes and soil fauna to attack it. This creates a temporary feast for soil microbes, but eventually they deplete their food supply and die off. Without a healthy microbial community, nutrients are no longer recycled, opportunistic pests can invade and farmers rely increasingly on chemicals to replace biological soil functions. Soil degradation is a critical problem because it threatens our ability to produce enough healthy food for a growing human population and contributes to climate change. In response, large companies, nonprofits, scientists and government agencies are working together to restore soil health. For example, General Mills is working with the Nature Conservancy and the Soil Health Institute to encourage farming practices that begin to rebuild soils. The first step to improving soil health is to stop the bleeding. Instead of leaving fields barren in between crops, which leads to erosion, farmers are increasingly planting cover crops such as rye grass, oats and alfalfa. They also are replacing intensive tilling with no-till practices to prevent the breakdown of soil structure. Soil organic matter contains over 50 percent carbon. Globally, soils contain more carbon than plants and the atmosphere combined. Losing carbon-rich organic matter from soils releases carbon dioxide, a greenhouse gas, which can accelerate climate warming. But by regenerating our soils, we can sequester more carbon underground and slow climate warming. In addition to protecting soil, cover crops take carbon out of the atmosphere as they grow and funnel it into the soil. Unlike cash crops that are harvested and removed from the soil, cover crops are left to decompose and contribute to soil formation. Increasing the supply of plant carbon in this way is an important first step in rebuilding soil carbon. But new research suggests that it may be insufficient. We used to think that soil organic matter was formed from leftover bits of plants that were difficult to degrade. Over time, we thought that these plant particles became chemically transformed into what was called humus – dark, long-lasting material left over when dead plants and animals decay. This view suggested that the key to building soils was getting a lot of dead plant material into the ground. Recently, however, technological advances have transformed our understanding of soil formation. There is now strong evidence that that the most persistent forms of soil carbon are formed primarily from dead microbial bodies rather than from leftover plant parts. The vast majority of old soil carbon appears to have undergone microbial decomposition. While plants are the original source of carbon for soils, microbes control its fate by using it as food, thus ensuring that at least some of it will remain in the soil. North Dakota farmer Gabe Brown describes ways to improve soil health, including relying on microbial action. Microbes can take a simple compound like sugar and transform it into the thousands of complex molecules found in soils. When microbes break plant matter down, they use some of the material they consume for building new biomass – that is, to fuel their own growth – and exhale the rest as carbon dioxide. The efficiency with which they create new biomass varies widely. Some microbes are like weeds: They grow quickly in food-rich environments, but are sloppy eaters and waste much of what they consume. Others are slow-growing but hardy, waste little and are able to survive times of starvation or stress. 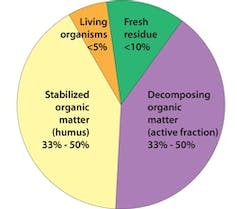 To maximize the proportion of plant carbon that is transformed into soil organic matter, we should aim to support and enhance soil microbiomes that quickly and efficiently transform dead plant materials into soil organic matter. Healthy soils should also contain microbiomes that help prevent disease, cycle nutrients and help reduce plant stress. My research group is now bioprospecting for groups of microbes that are especially efficient at forming new soil and recycling nutrients. We are also researching which crop traits support microbiomes that help enhance soil health. Making soils more healthy will make it possible to grow more food with fewer inputs, which will make farming more profitable and protect our air and water. Visit elsevier.com to access content on soil science, food security, agriculture and more! Use discount code STC317 at checkout and save up to 30% on your very own copy!